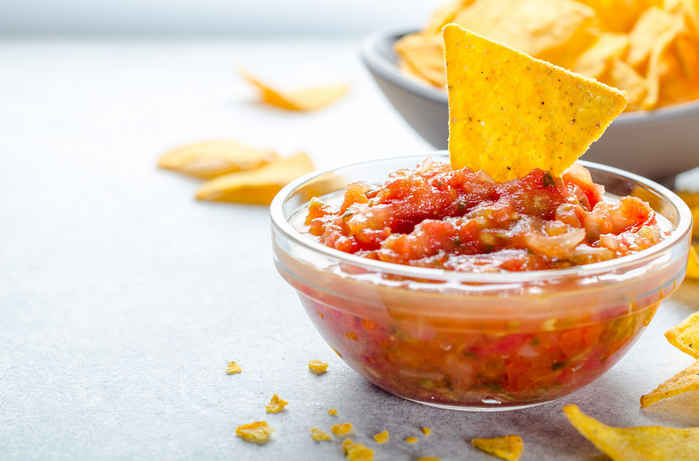 There are two options for FODMAP-friendly salsa. I’m a salsa snob and this is a problem when you’re Low FODMAP. The problem is garlic and onions. It’s very difficult to find salsa that doesn’t have garlic and/or onions in it. Trust me, I’ve stood in the aisle of my supermarket reading the ingredient labels on over three dozen brands. They all have garlic and onions in them. It’s a staple of salsa. So what do you do while you avoid these on a Low FODMAP diet? There are two options: make your own salsa or buy special low FODMAP salsa from Fody Foods. Let’s start with the make your own option. It might sound crazy at first, but a made-at-home salsa can be very refreshing, simple to make and respect your gut. Tomatoes – you’re going to need to start with tomatoes. Although you can buy canned diced tomatoes, these often have garlic or onion in them. So I recommend buying a few tomatoes from the produce aisle. Cilantro – this is another key ingredient you’ll find in salsa. Vinegar – use regular or apple cider vinegar. Although apples and apple cider are a no-no on the low FODMAP diet, some apple cider vinegar is OK.
Green onions – if you skip the white bottoms, green onions are OK on the low FODMAP diet. Consider adding some green onions for flavor. I understand if you don’t want to make your own salsa, and thankfully there’s one jarred salsa option. Unfortunately, you’ll probably have to order it online because your grocery store doesn’t carry it. It’s salsa from Fody Foods. It’s available in either mild or medium. It’s also surprisingly good. As I said at the top, I’m a salsa snob. But Fody Food’s salsa is very tasty. Whether it’s homemade salsa or Fody’s garlic-and-onion-free variety, you don’t have to skip salsa just because you’re on a low FODMAP diet.